Are you looking for a way to transition your child to become an athlete? 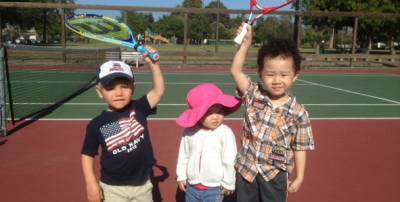 Come join us at Euro School of Tennis 38350 Alta Drive, Fremont, CA 94536. Searching for a method to teach your child physicality, agility, and discipline? Mommy, Daddy, and Me classes at the Euro School of Tennis offers the perfect way to bond with your child while doing so. The active setting in our Mommy, Daddy, and Me Class is a crucial part of physical and mental development for a young child, learning through play. One clinic per week is $95/month (four meetings a month). The Euro Member rate is $80/month.